Tripura continued to see post-poll violence for a fourth straight day, even as the Northeast Assembly elections result 2018 sank in. Communist icon and leader Vladimir Lenin became the symbolic casualty, with at least two of his statues in the state being razed or pulled down. The Left was defeated in the Tripura Assembly polls 2018 by the Bharatiya Janata Party (BJP) and its ally Indigenous People’s Front of Tripura (IPFT), which together won a two-thirds majority in the House in a state where the Communist Party of India-Marxist (CPI-M) had been in power for 25 years. Both the BJP and the CPI(M) have urged everyone to maintain peace. Chief Minister-designate Biplab Kumar Deb repeatedly urged Tripura’s people not to disturb the peace and abstain from attacking the rival party’s members. He said that anybody indulging in violence would be punished. On Tuesday, Home Minister Rajnath Singh spoke to state Governor Tathagata Roy and the director general of police and asked them to ensure peace till a new government was installed. 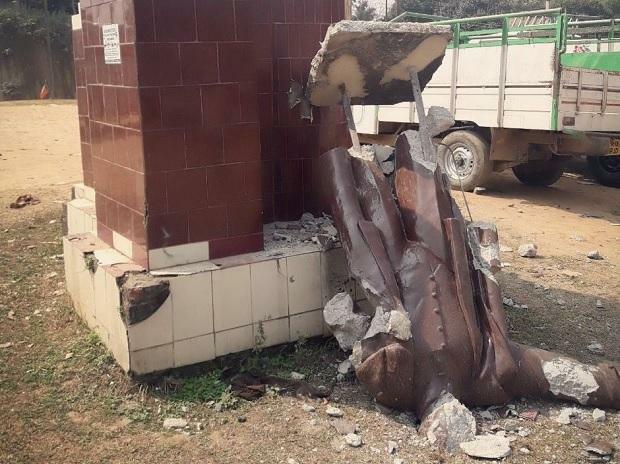 Meanwhile, according to reports, at least two statues of communist leader Lenin were brought down in South Tripura. Along with the CPI(M), Opposition parties, including the Congress and the All India Trinamool Congress, condemned the razing of these statues. On Monday evening, BJP activists brought down an 11.5-feet fibre statue of Vladimir Lenin with a bulldozer in Belonia, according to an earlier report. Speaking to the media earlier on Tuesday, CPI(M) leader Haripada Das said: “The BJP supporters, chanting ‘Bharat Mata Ki Jai’, knocked down the statue of Lenin near a government college in Belonia.” Das added that the statue was set up a year ago in Belonia, South Tripura’s district headquarters, around 90 km from Agartala. The state police corroborated the fact that the communist icon’s statues had been razed. On Tuesday, the police said that two statues of Vladimir Lenin were brought down in South Tripura. The statues were pulled down just days after the Left was defeated in the 2018 Assembly polls by the BJP and its ally IPFT.